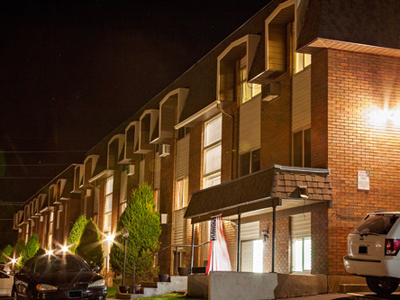 Our shared apartments are the perfect solution for affordable student housing. Each shared apartment has two large bedrooms, one bathroom, and a large storage room. Air conditioning is available in the top & middle apartments while the bottom floor apartments stay cool. Each apartment is fully furnished with kitchen appliances, full set of couches and end tables with a TV stand. Each bedroom is furnished with 2 twin beds and 2 dressers. As an added bonus each apartment features a quality vacuum; high speed internet, cable, and utilities are included in rent as well. The private apartments are perfect for those in the market for a little more space at and affordable rate. Each apartment includes 4 private bedrooms with one bathroom and a double sink vanity in the hall area outside of the bathroom. Each apartment is fully furnished with kitchen appliances, full set of couches and end tables with a TV stand. Each bedroom is furnished with 1 twin bed and a full sized dresser. Air conditioning and gas heat are also featured. Are you looking for that place that is home away from home? Check us out because the apartments are fully furnished, clean, comfortable, affordable, and included in your rent is high-speed internet and basic phone. 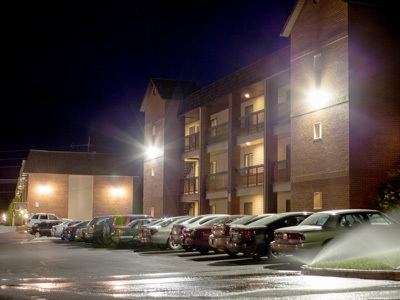 The apartments are a short walking distance from Utah State University. Enjoy as you choose potluck on Tuesdays, bridge most nights of the weeks, and many other social events offered at D’s Bridgerland Apartments for our summer citizens. D's Bridgerland Apartments has a CVTD bus stop on the corner of the property. Need some maintenance on your apartment? Help us by submitting a maintenance request here! Where is D's Bridgerland Apartments located?